After stamping its immense success in its own home town now ELEGANZA has embarked not only in Mumbai but Pune as well, increasing its reach to every city every year. This year 2014 is another year to look forward to with Pune’s Top Notch Venue, leading Dj, Super attractive performers, 7 course scrumptious buffet, complimentary return gifts to guests, photo ops with media & friends, fire shows, laser shows and unlimited Entertainment . 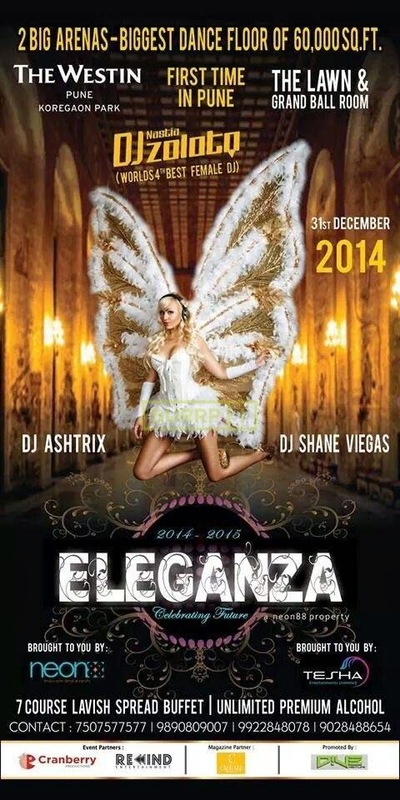 This thematic property will illuminate and present DJ performance by Dj Nastia Zoloto (World’s 4th best female Dj ) along with Pune’s most renowned Djs – Dj Ashtrix & Dj Shane Viegas on 31st December 2014-2015. You will also witness the vibrance just as celebs dance on magical tunes of Bollywood, Top Dance NO’s, UK Punjabi music till wee hours.Grand set up , with special attention, along with food and alcohol ,lasers , Fire show And much more shall be available at special prices.